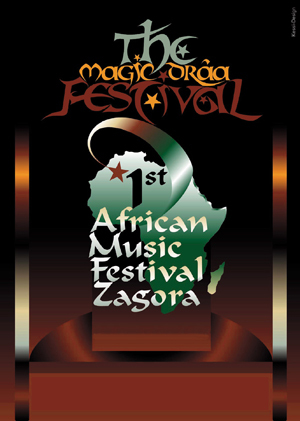 The first festival for African music, „The Magic Drâa Festival” is a cultural event that highlights the great variety and genuineness of music, art and crafts of the Drâa valley’s inhabitants. Aside from local artists, modern and traditional African musicians and dancers from all over the world are invited to present their work at the festival. By bringing together its participants, the festival wants to help overcome cultural boundaries and encourage intercultural understanding. The main objective of the Drâa Festival is to bring back the prosperity of past times to the city of Zagora.